Western Anatolia has been formed by the motions of the African plate, Arabian plate and Hellenic Subduction zone. The Hellenic Subduction zone, which has high seismicity, is the main tectonic feature of the eastern Mediterranean Sea related to the subduction of the African Plate beneath the Aegean Sea Plate. The Hellenic Subduction zone has a complex lithospheric structure and shows complex differences in the Aegean Sea in terms of continental crust thickness and mantle velocity. 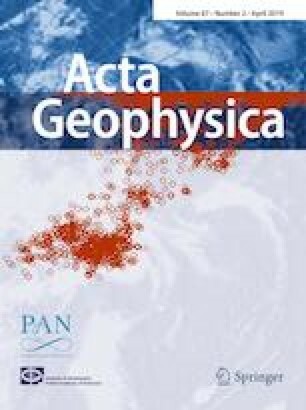 In the study area, the directions of Global Positioning System (GPS) velocity vectors which are towards SE change towards S from North of Western Anatolia to Hellenic Subduction zone. It is thought that the factor which controls this mechanism is the shear force or subduction zone located in Aegean Sea. Western Anatolia region, which is located in Western Anatolia Extensional province, includes several morphologically significant N–S trending active normal faults. Besides, the NE–SW and NW–SE trending faults, which their kinematic features change from north to south, are very effective on the tectonic regime of the region. Additionally, for determining the boundaries of these tectonic elements, the Complete Spherical Bouguer (CSB) gravity anomaly of study area was calculated by using World Gravity Map (WGM2012) model. Moreover, in historical and instrumental studies, the high seismicity of the study area is remarkable. It is thought that this case is also related with the mechanism which oriented the GPS velocity vectors to southward. Consequently, the dominant kinematic structure of the region was classified by combining the GPS velocity vectors computed for Izmir and its surroundings bounded by Western Anatolia, Aegean Sea and Eastern Mediterranean and the CSB gravity anomaly. Finally, the results were interpreted together with focal depth distributions of earthquakes and Bouguer gravity data.